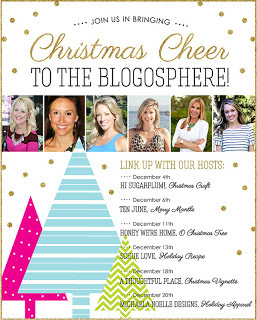 Christmas Cheer To The Blogosphere! 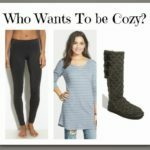 If you’re new here, welcome to Pinterest Told Me To! If you’re new, this isn’t what I normally do. On a regular day here at Pinterest Told Me To, I take outfits that I’ve pinned on Pinterest and I re-create them with things out of my own closet. You can check out a recent example here (this one has a story that you don’t want to miss)! TODAY I’m getting my Christmas craft on. 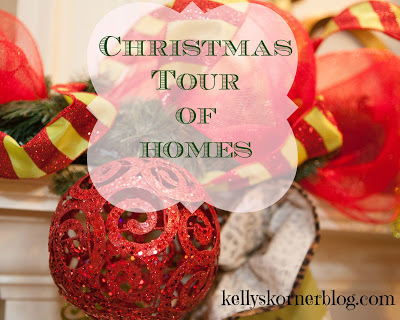 I know it’s not technically a tour of my house, but you do get to see my family room, and I couldn’t pass up the opportunity to link up with Kelly! 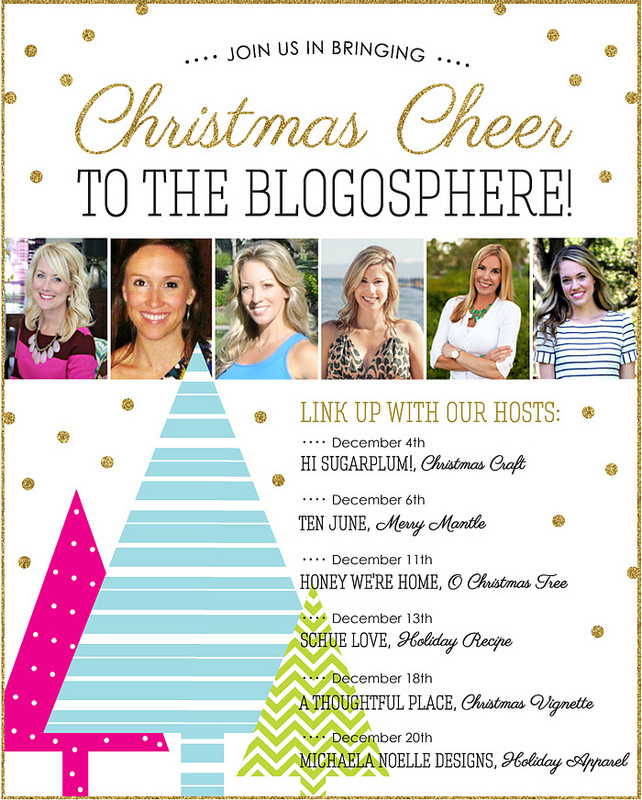 Plus, it’s such a sweet and easy craft to do, I thought you ladies might want to give it a whirl yourself! I’m going to be highlighting a craft that Carter and I did last year. True to form, I found inspiration on Pinterest. but I really got in to this one! I LOVE, LOVE, LOVE these little canvases. The Christmas tree is probably my favorite. I love all of his 3 year old little hands stacked on top of each other. They really tug on this mama’s heart. I just used a pencil to do a rough sketch of about what size I wanted the tree to be. The two bottom rows are both made up of 5 handprints, I just overlapped them more on the 2nd row. I then did 4 handprints, then 3, then 2, then 1. 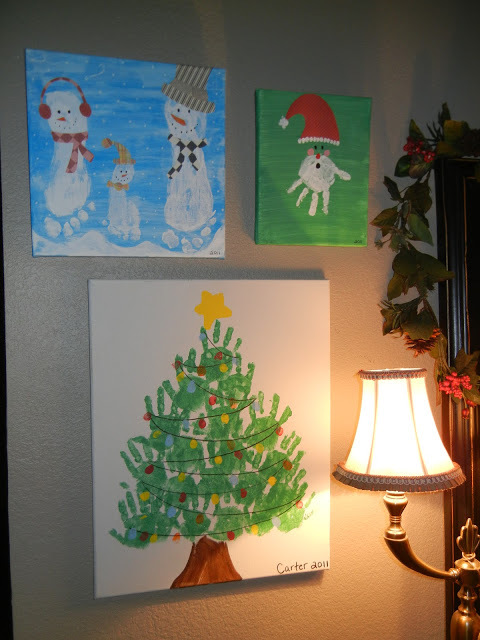 I painted the tree trunk and the star. I kind of went canvas crazy. Again, I searched Pinterest for additional inspiration. I found some snowmen made out of feet and this next little guy was born. I painted the entire canvas with a mixture of blue and white paint for a nice light blue. I painted the eyes, mouths, and noses. It was cute, but there wasn’t enough wow factor. And this is where I even surprised myself with my awesomeness. I used scrapbook paper for the hats, the earmuffs, and the scarves. And yes…that’s my foot, Carter’s foot, and the hubby’s foot. Please take a minute to oooh and ahhhhh appropriately. So, now that I had 2, I HAD to have 3. You know..the whole odd number design thing came in to play. So, I went back to Pinterest…..again. 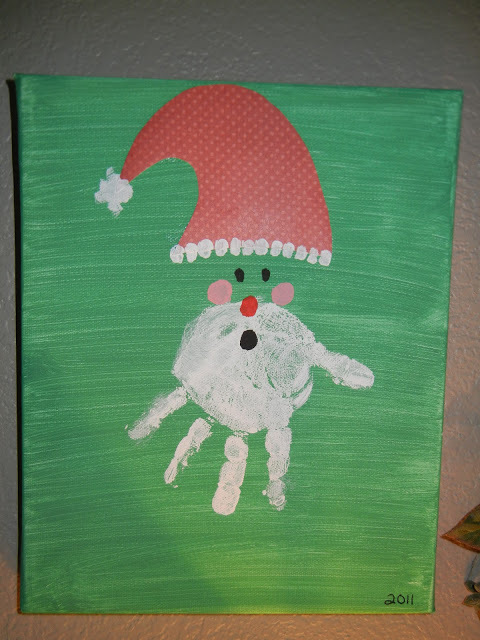 I settled on the handprint Santa, and I think he is precious! The hat is scrapbook paper, but everything else is painted. (and they were the very last ones I took down last year). I think they look great nestled in with my regular decor. I know that I will treasure these each and every year I pull them out! 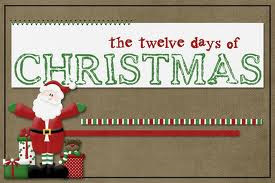 So…….on the 7th day of my Christmas series…..something handmade is what I’m suggesting! 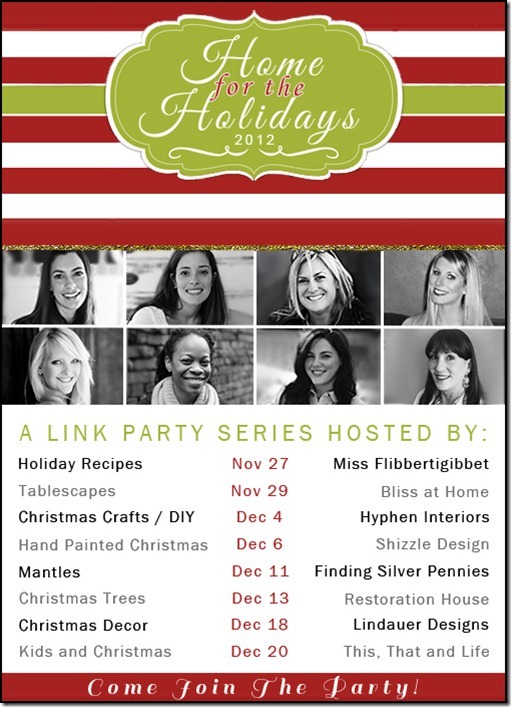 Just found 2 other Christmas linky parties! I must have been a very good girl. I still think you paid someone to make those art boards. My friend Sheaffer is not crafty. In fact, she mocks those who are (she mocks them with me, of course). They are just sooooo cute that if she really did make them, then I think she's a closet crafter. It's time for her to come out of the closet. How adorable! You have a secret crafty side!! These are so cute!!! Girl, you are crafty!! Oh, how precious! You'll still be hanging those when he's a teenager, trust me. My sixteen year old son just LOVES when I pull out all of his old Chrismtas crafts…not. It makes mom a little teary-eyed though. Totally cute! 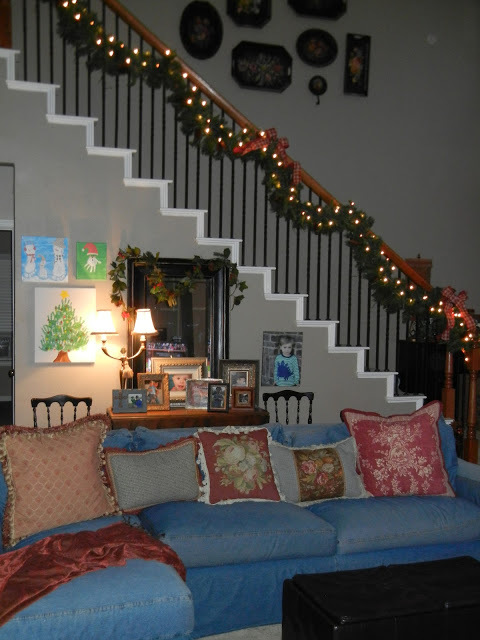 I love those canvas ideas…my kids would love to do that! SO fun!! And you said you weren't crafty…ha! Excuse me missy, these are ADORABLE!!!! I will definitely be copying this idea to do with my niece when she gets older. Super cute! Great job for someone who isn't crafty! Okay, these are ADORABLE!!!!! You (and Carter) did such a good job! I need to do these with my girls! 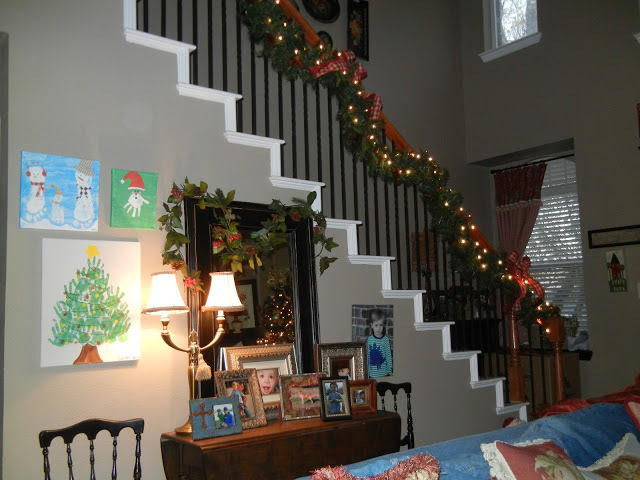 And, can we talk about how much I love your garland on your stairs? LOVE. BTW, I don't know why I thought you had more kids. I just realized that you have 1 little one, and a pup. Those are so precious!! I like the snowmen!! Wow! I want to do these! Do you have a template for the parts you used scrap paper? Seems to me that you are pretty crafty! Hi there! I didn't use templates. After I made the hand or footprints, I just freehanded what size I thought they should be. It took a couple of tries, but I got it right! You are good! I don't believe that you are not crafty! Thanks! What sizes are the canvas? Thanks for the help! Hi Holly! So sorry it took me so long to respond. I just used craft paint. 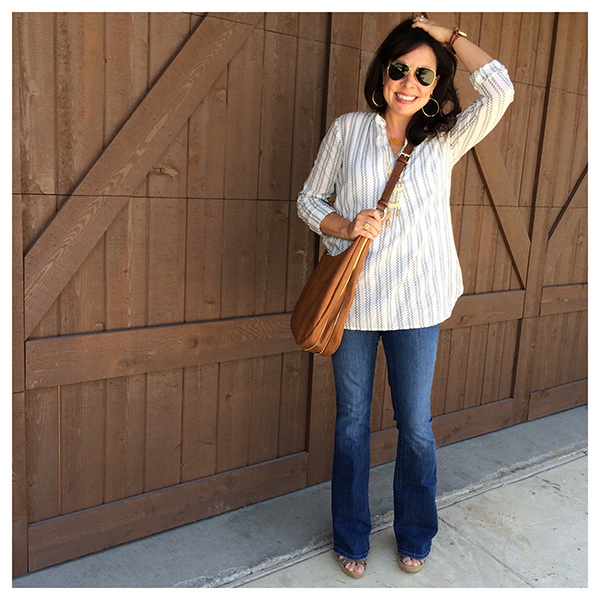 Super inexpensive, and it lasts forever! 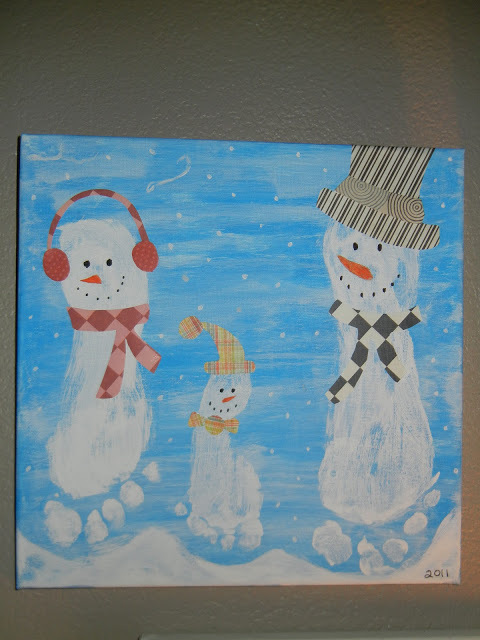 I have the snowman feet print canvas, too… My mother in law made it for me with my kid's prints last year! I have a rookie question….I just made all three! I ADORE them & they came out perfect! However I used my kids washable paint which was probably a terrible idea since I could essentially wash the canvas clean. What did you use? Hoping there is something I can put/spray over it to make it permanent. Hi there! 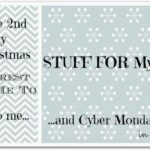 Okay…I'm totally a rookie myself when it comes to crafts…but I will try to answer your question! I do think that there is probably some sort of clear spray you could buy at the craft store that would "set" the paint. 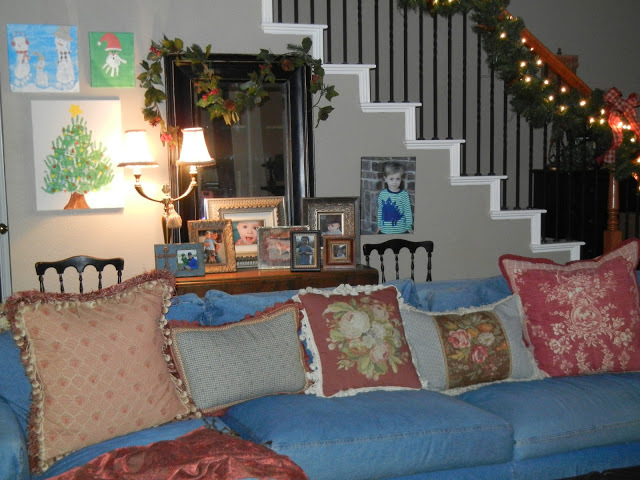 Off the top of my head, I'm also thinking that you could probably just paint a clear coat of Mod Podge over the canvases. It goes on white (which can be scary), but it dries clear. I do think that it might change the texture of the canvas a bit (not much), so you might want to ask an expert at the craft store what they would suggest. 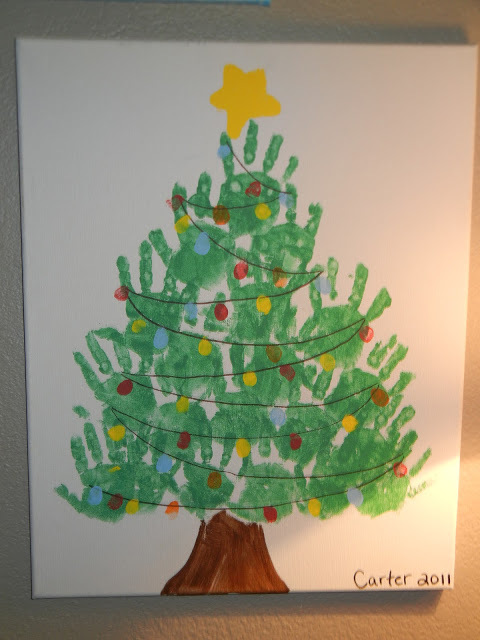 That's a really adorable handprint Christmas tree – good job! Just popping in from the Nester's party (still working my way through those links!) 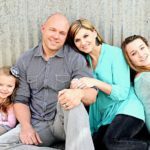 – Merry Christmas!